Washington State's first head football coach was William Goodyear. That team played only two games in its inaugural season in 1894, posting a 1–1 record. The team's first win was over Idaho. The first paid head football coach was William L. Allen, who served as head coach in 1900 and 1902, posting an overall record of 6–3–1. John R. Bender served as head football coach from 1906–1907 and 1912–1914, compiling a record of 21–12. William Henry Dietz was the Cougars' head football coach from 1915–1917, posting a stellar 17–2–1 record. 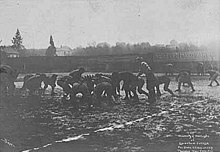 Dietz's 1915 team defeated Brown in the Rose Bowl, and finished with a 7–0 record. Dietz was inducted into the College Football Hall of Fame as a coach in 2012. Albert Exendine served as Washington State's head football coach from 1923–1925, posting a 6–13–4 overall record. Babe Hollingbery was the Cougars' head football coach for 17 seasons, posting a 93–53–14 record. His 93 wins are the most by any head football coach in Washington State football history. Hollingbery's 1930 team played in the 1931 Rose Bowl, a game they lost to Alabama. The Cougars didn't lose a single home game from 1926–1935. Among the Cougar greats Hollingbery coached were Mel Hein, Turk Edwards and Mel Dressel. The Hollingbery Fieldhouse that serves many of Washington State's athletics teams, was named in his honor in 1963. He was inducted into the College Football Hall of Fame as a coach in 1979. The Cougars did not field a football team from 1943 to 1944 because of World War II. After the war ended, Phil Sarboe was hired away from Lincoln High School in Tacoma, Washington, to return to his alma mater as the head football coach. Sarboe's Cougars posted a 17–26–3 record in his five seasons. Forest Evashevski took over the Cougars football program as the head coach in late 1949. His 1951 team finished the season ranked #14 in the Coaches' Poll and #18 in the AP Poll. He posted an 11–6–2 record in his two seasons before leaving to take the Iowa head football coach position. Evashevski was inducted into the College Football Hall of Fame as a coach in 2000. Al Kircher, an assistant on Evashevski's staff, was promoted to head coach following Evashevski's departure. Kircher didn't enjoy as much success as his predecessor, going 13–25–2 in his four seasons as head coach. He was not retained after his contract expired. Jim Sutherland was Washington State's 21st head football coach. He held the Cougars head coach position for eight seasons. His overall record with the Cougars was 37–39–4. Bert Clark served as Washington State's head football coach for four seasons, posting a record of 15–24–1. His best season was 1965, when the Cougars went 7–3 and defeated three Big Ten teams on the road. That season was Clark's only winning season, as he failed to win more than three games in his other seasons. Clark was not retained after the end of his fourth season. Jim Sweeney served as the Cougars head football coach for eight seasons. His final record was 26–59–1. Sweeney's best season was 1972, when the Cougars finished 7–4. That was his only winning season. Sweeney was let go after the 1975 season. Jackie Sherrill was Washington State's head coach for one season. His team posted a 3–8 record. Sherrill departed after that one season to accept the head football coach position at Pittsburgh. Warren Powers served as head coach for one season before accepting the head football coach position at Missouri. Jim Walden was promoted to head coach following the departure of Powers. Walden led the Cougars to one bowl appearance, the 1981 Holiday Bowl, a game they lost to BYU. That bowl appearance was Washington State's first in 51 years. Walden won Pacific-10 Coach of the Year honors in 1981 and 1983. Walden's final record at Washington State was 44–52–4. Players coached by Walden at Washington State include Jack Thompson, Kerry Porter, Rueben Mayes, Ricy Turner, Ricky Reynolds, Paul Sorensen, Brian Forde, Lee Blakeney, Mark Rypien, Dan Lynch, Pat Beach, Keith Millard, Erik Howard, and Cedrick Brown. Walden left after the 1986 season to accept the head football coach position at Iowa State. 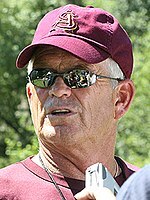 When he was named Washington State's head football coach on January 7, 1987, Dennis Erickson said it was his lifelong dream to become the head football coach of the Cougars. His contract he signed in 1987 was a five-year deal at an annual base salary of $70,000, with up to $30,000 from radio, television, and speaking obligations. Erickson's Cougars posted a 3–7–1 record in his first season but improved to a 9–3 record in 1988, capped with a victory in the Aloha Bowl, the Cougars' first bowl victory since 1916. Although stating publicly a week earlier that he would not leave Washington State, Erickson accepted the head football coach position at Miami in March 1989, leaving the Cougars after two seasons and a 12–10–1 overall record. Mike Price came to Washington State from Weber State. Price led the Cougars to unprecedented success, taking his 1997 and 2002 teams to the Rose Bowl, both times losing. The 1997 team was led by star quarterback Ryan Leaf, who would be the second overall pick in the 1998 NFL Draft by the San Diego Chargers. Those teams finished ranked #9 and #10 in the Coaches' and AP Polls, respectively. Price also led the Cougars to victories in the Copper Bowl, the Alamo Bowl and the Sun Bowl. Price's record at Washington State is 83–78. It was during the 2002 season that Washington State received its highest ranking ever in the modern era within the AP Polls at #3. Price resigned following the 2002 season to accept the head football coach position at Alabama, but was fired before ever coaching a game for the Crimson Tide due to an off-the-field incident. Bill Doba was promoted from defensive coordinator to head coach following Price's departure. Things started out well for Doba's Cougars, as they went 10–3 in Doba's first year to finish ranked #9 in both the AP and Coaches' Polls. But, things went downhill. The Cougars slipped to 5–6 in 2004, and posted a 4–7 record in 2005. A 6–6 2006 season followed, and after finishing the 2007 season 5–7, Doba was fired. He finished with a 30–28 record. Paul Wulff was hired away from Eastern Washington to replace the fired Bill Doba. Wulff struggled mightily as the Cougars head football coach, failing to win more than four games in a single season. His final record at Washington State is 9–40, the lowest winning percentage (.184) of any head coach in Washington State football history. Wulff was fired after the 2011 season. In November 2011, it was announced that Mike Leach would replace Wulff as head coach. Leach had previously spent 10 seasons as head coach at Texas Tech Red Raiders football. In 2012, Mike Leach's first season, the new coaching staff installed an Air raid offense; an exciting, up-tempo, pass-oriented offensive attack which led the Pac-12 Conference in passing offense. In his second season, Leach led Washington State to the 2013 Gildan New Mexico Bowl, the first bowl game for the Cougars in a decade. Leach received a 2-year contract extension on November 18, 2013 after leading the Washington State Cougars to their best record since 2006. In 2015, Mike Leach guided the Washington State Cougars to their first bowl victory since the 2003 season. In that same year, the team also posted a 9–4 winning season and was ranked in the AP Poll, Coach's Poll, and College Football Playoff ranking. Mike Leach was named the Pac-12's co-Coach of the Year as well as the Associated Press Pac-12 Coach of the Year. After the season, Washington State again extended coach Mike Leach's contract, this time through the 2020 season. In 2016, sandwiched between a two game losing streak to begin and three game losing streak to end the season, the Cougars rode an eight game winning streak to a place in the Holiday Bowl where they lost to Minnesota by a score of 17-12. They finished with a 7-2 Pac-12 record and overall record of 8-5 for 2016. Huge wins over Oregon and #15 Stanford contributed to the Cougars best finish in Pac-12 conference play since the 2003 team went 6-2. After the death of the team's quarterback - Tyler Hilinski (which was later ruled a suicide) in January 2018, graduate transfer Gardner Minshew from East Carolina was recruited by Leach to fill the void. Minshew and other veteran players such as Peyton Pelluer rallied the team in honor of their former teammate Hilinski and led Washington State to a memorable season for Cougar football fans. With a 28-26 win over #24 Iowa State in the Alamo Bowl, Washington State won 11 games for the first time in school history and finished the season 11-2. Dating back to their days in the Pacific Coast Conference, Washington State won four conference titles through the 2017 season. Washington State has made 15 bowl appearances, and has a bowl record of 8–7. :88-94 The Cougars have played in four Rose Bowls (1 win, 3 losses), three Holiday Bowls (1 win, 2 losses), the Sun Bowl (2 wins), Alamo Bowl (2 wins), Aloha Bowl (1 win), Copper Bowl (1 win), and New Mexico Bowl (1 loss). Prior to the 1975 season, the Pac-8 allowed only bowl team, to the Rose Bowl. From 2015 through 2018, the Cougars made four consecutive bowl appearances for the first time in program history, all under current head coach Mike Leach. He is currently tied with Mike Price for overall bowl appearances at five; the other five head coaches with bowl appearances made one each. Martin Stadium, home of Cougars football. Anchored on the west end-zone is the Cougar Football Complex. Washington State has had a rivalry with Washington since first playing 118 years ago in 1900. The series is 73–32–6 in favor of Washington, with the Huskies winning the last six games as of 2018. The teams played for the "Governor's Trophy" from 1934 to 1961. The game was renamed the Apple Cup in 1962 because of Washington's national reputation as a major producer of apples. Since 2011, the game is commonly played on the Friday after Thanksgiving. The two land-grant universities are less than eight miles (13 km) apart on the rural Palouse in the Inland Northwest; Idaho's campus in Moscow is nearly on the Idaho–Washington border, and Washington State's campus is directly west in Pullman, linked by Washington State Route 270 and the Bill Chipman Palouse Trail. The first game was played 125 years ago in November 1894 and resulted in a win for Washington State. The series was played intermittently since the 2007 season. However, with Idaho's move down to FCS in 2018, the future of the rivalry is uncertain. Eight players have finished in the Top 10 of the Heisman Trophy voting. Ryan Leaf had the highest finish in the Heisman balloting in program history. Four players and three coaches from the Washington State Cougars football program have been inducted into the College Football Hall of Fame. Two former Washington State football players have been inducted into the Pro Football Hall of Fame. Four former Washington State football players have been inducted into the Canadian Football Hall of Fame. The Cougars have retired two numbers. The AFCA Coach of the Year Award is given annually to a college football coach by the American Football Coaches Association (AFCA). Mike Leach is the first and only coach in the Washington State football program history to have received this distinguished award. Five Washington State football head coaches have received the annual award a total of eight times as the conference's Coach of the Year. Mike Leach has served as Washington State's head coach since the 2012 season. Announced schedules as of June 6, 2017. ^ Washington State University Athletics Department Brand Identity Guidelines (PDF). Washington State Cougars. April 18, 2013. Retrieved April 6, 2017. ^ Stalwick, Howie (August 14, 2012). "Stadium a Little Bigger, Way Better for Cougars". The News Tribune. Tacoma. Retrieved January 9, 2013. ^ a b c d e "Washington State Football History Database". nationalchamps.net. Retrieved 7 March 2015. ^ "John Bender". College Football at Sports-Reference.com. Retrieved 7 March 2015. ^ "William Dietz". College Football at Sports-Reference.com. Retrieved 7 March 2015. ^ "William 'Lone Star' Dietz Posthumously Inducted Into Football Hall of Fame". Indian Country Today Media Network.com. Retrieved 7 March 2015. ^ "Albert Exendine". College Football at Sports-Reference.com. Retrieved 7 March 2015. ^ a b "O.E. Hollingbery". College Football at Sports-Reference.com. Retrieved 7 March 2015. ^ a b c d e "National Football Foundation". footballfoundation.org. Retrieved 7 March 2015. ^ a b "College Football, College Basketball, NCAA". LostLettermen.com. Retrieved 7 March 2015. ^ "Phil Sarboe". College Football at Sports-Reference.com. Retrieved 7 March 2015. ^ a b c "Former Iowa football coach Forest Evashevski dies – ESPN". ESPN.com. Retrieved 7 March 2015. ^ a b "Forest Evashevski". College Football at Sports-Reference.com. Retrieved 7 March 2015. ^ a b "Former Washington State coach Al Kircher dies". ESPN.com. Retrieved 7 March 2015. ^ "Alton Kircher". College Football at Sports-Reference.com. Retrieved 7 March 2015. ^ a b "Jim Sutherland". College Football at Sports-Reference.com. Retrieved 7 March 2015. ^ a b c d "Bert Clark". College Football at Sports-Reference.com. Retrieved 7 March 2015. ^ a b "Robert 'Bert' Clark Jr., 1930–2004: WSU coach's tenure included 'Cardiac Kids'". seattlepi.com. Retrieved 7 March 2015. ^ a b c d "Jim Sweeney". College Football at Sports-Reference.com. Retrieved 7 March 2015. ^ "Local News – FresnoBee.com". fresnobee.com. Retrieved 7 March 2015. ^ a b "Jackie Sherrill". College Football at Sports-Reference.com. Retrieved 7 March 2015. ^ "Smizik: Pitt football's biggest loss is Jackie Sherrill". Pittsburgh Post-Gazette. Retrieved 7 March 2015. ^ "Warren Powers". College Football at Sports-Reference.com. Retrieved 7 March 2015. ^ "The Daily Reporter". google.com. Retrieved 7 March 2015 – via Google News Archive Search. ^ a b c d e f g "Jim Walden: A Man of Many Words". wsucougars.com. Retrieved 7 March 2015. ^ a b c "Jim Walden". College Football at Sports-Reference.com. Retrieved 7 March 2015. ^ "Spokane Chronicle". google.com. Retrieved 7 March 2015 – via Google News Archive Search. ^ a b c "Dennis Erickson". College Football at Sports-Reference.com. Retrieved 7 March 2015. ^ "Not Seeking Florida Job, Erickson Says". Los Angeles Times. Retrieved 7 March 2015. ^ a b c d e f g "Mike Price Retirement: A look back at his time at Washington State". CougCenter. Retrieved 7 March 2015. ^ Leaf, Ryan. "Ryan Leaf's lessons from his NFL draft nightmare". ^ a b c "Mike Price". College Football at Sports-Reference.com. Retrieved 7 March 2015. ^ "USATODAY.com – Price fired as coach of Alabama football". usatoday.com. Retrieved 7 March 2015. ^ "Washington State hires Doba". NewsOK.com. Retrieved 7 March 2015. ^ a b c d "Bill Doba". College Football at Sports-Reference.com. Retrieved 7 March 2015. ^ "WSU fires head coach Doba". The Seattle Times. Retrieved 7 March 2015. ^ "EWU's Paul Wulff hired as new Coug coach – WSU News". WSU News. Retrieved 7 March 2015. ^ a b "Paul Wulff". College Football at Sports-Reference.com. Retrieved 7 March 2015. ^ "2010 Washington State Football Media Guide" (PDF). Washington State University. p. 142. Retrieved 2011-09-09. ^ "Washington State Cougars fire Paul Wulff as football coach – ESPN". ESPN.com. Retrieved 7 March 2015. ^ a b "Mike Leach Biography". ^ "Mike Leach receives 2 year extension". Retrieved November 18, 2013. ^ "WSU extends Mike Leach's contract after 9–4 season, Sun Bowl win". Retrieved January 8, 2016. ^ "WSU Cougars' Mike Leach is co-Pac-12 Coach of the Year; Luke Falk, Gabe Marks, Joe Dahl named to All-Pac-12 first team". Retrieved January 8, 2016. ^ "WSU's Mike Leach named Associated Press Pac-12 coach of the year". Retrieved January 8, 2016. ^ "Cougars Extend Mike Leach Through 2020 Season". Retrieved January 8, 2016. ^ Bonagura, Kyle (January 24, 2018). "Police: Rifle used in Tyler Hilinski's suicide taken from former teammate". ESPN – via ABC News. ^ "2016 Football Media Guide" (PDF). Washington State Cougars Athletics. Retrieved January 12, 2018. ^ "Pac-12 Conference - 2016 Football Media Guide". Catalog.e-digitaleditions.com. 2016. pp. 91–92. Retrieved 2017-12-03. ^ a b c "2018 Washington State Football Media Guide" (PDF). Washington State University. ^ "Washington State University Bowl Game History". ^ Withers, Bud (January 6, 2014). "Apple Cup moving back to Saturday for 2014". Seattle Times. Retrieved January 25, 2014. ^ "Heisman Trophy voting results since 1976". sports.yahoo.com. Archived from the original on 13 December 2015. Retrieved 7 December 2015. ^ "1997 Heisman Trophy Voting". Retrieved 7 December 2015. ^ "FOOTBALL AWARD WINNERS" (PDF). ncaa.org. NCAA. p. 28. Retrieved November 20, 2018. ^ a b c d e "Entering the Hall: William 'Lone Star' Dietz". Retrieved 2016-09-23. ^ a b College Football Hall of Fame. "Inductee Search Results by College". College Football Hall of Fame. Retrieved 8 December 2015. ^ a b c "WSU Cougars OL Mike Utley named to College Football Hall of Fame". 8 January 2016. Retrieved 3 December 2017. ^ Pro Football Hall of Fame. "Inductees by College". PFHOF. Retrieved 7 December 2015. ^ a b c Canadian Football Hall of Fame. "Hall of Fame College Affiliations". CFHOL. Archived from the original on 1 February 2016. Retrieved 8 December 2015. ^ Cougar History and Awards. "WSU Cougar Lettermen" (PDF). WSU Athletics. Retrieved 8 December 2015. ^ WSU Mike Leach Named AFCA National Coach of The Year. "WSU Mike Leach Named AFCA National Coach of The Year". The Seattle Times. Retrieved 8 January 2019. ^ Pac-12 Coach of the Year Winners. "Pac-12 Coach of the Year Winners". Sports Reference LLC. Retrieved 8 January 2016. ^ "Washington State Football Program". Washington State University Athletics, Retrieved: 13 December 2015. ^ "Washington State Cougars Football Schedules and Future Schedules". fbschedules.com. Retrieved June 6, 2017. Wikimedia Commons has media related to Washington State Cougars football.